PHOTO: Sgt. 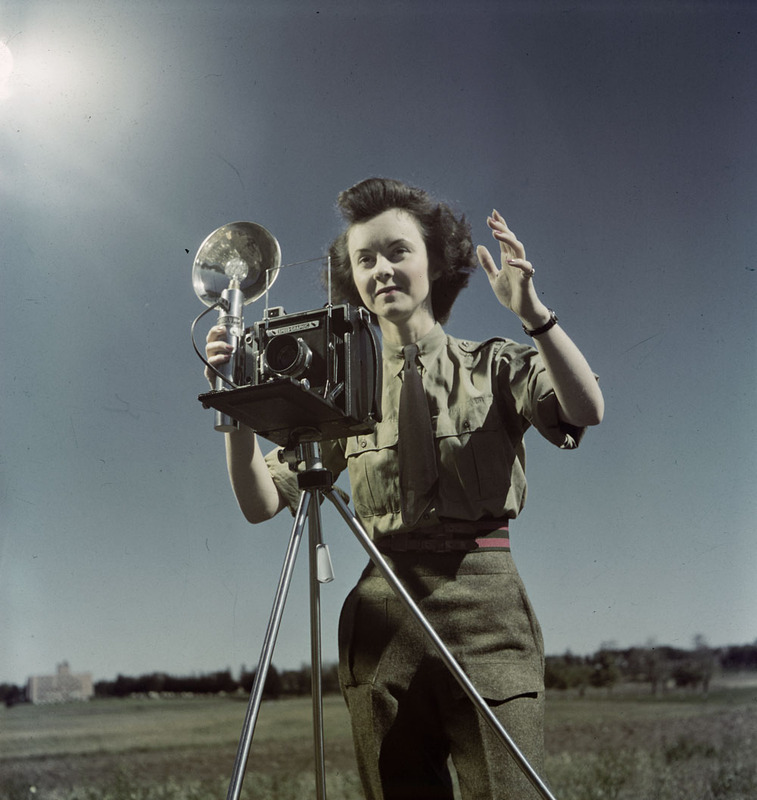 Karen Hermeston, CWAC, with Speed Graphic Camera from WWII. Copyright belongs to the Crown ; Credit: Canada. Department of National Defence / Library and Archives Canada / ecopy. Item no. ZK-893-4. PHOTO: Sgt. 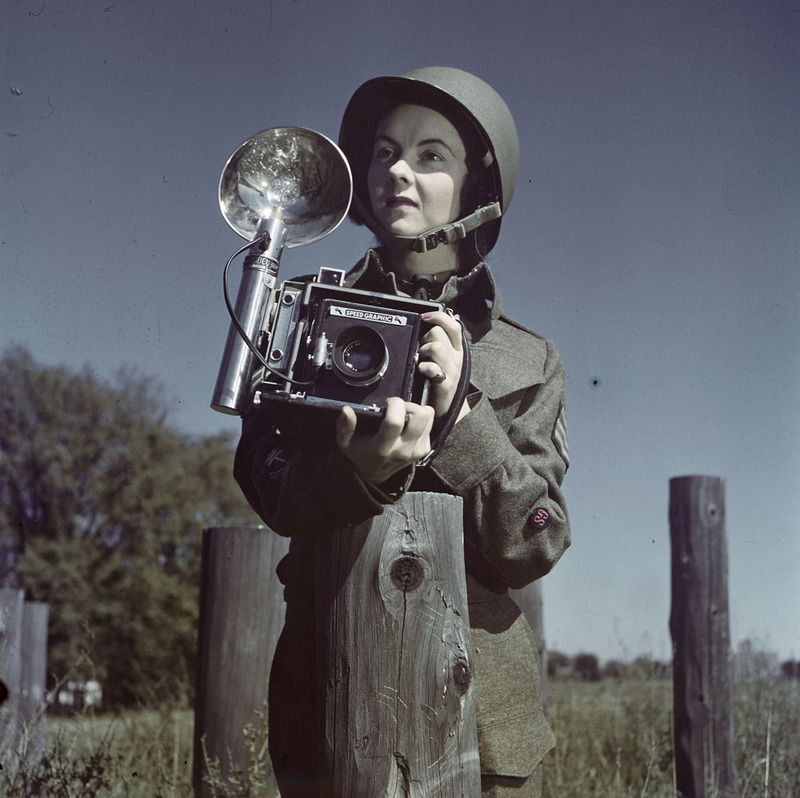 Karen Hermeston, CWAC, with Speed Graphic Camera from WWII. Copyright belongs to the Crown ; Credit: Canada. Department of National Defence / Library and Archives Canada / ecopy. Item no. ZK-893-5. PHOTO: Sgt. 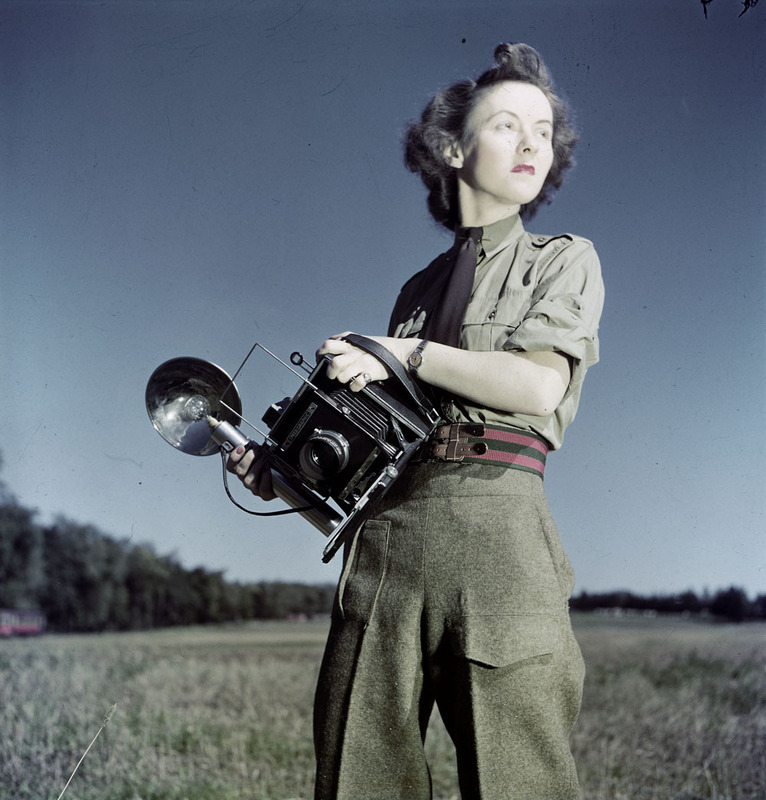 Karen Hermeston, CWAC, with Speed Graphic Camera from WWII. Copyright belongs to the Crown ; Credit: Canada. Department of National Defence / Library and Archives Canada / ecopy. Item no. ZK-893-6. PHOTO: Sgt. Karen Hermeston, CWAC, with Speed Graphic Camera from WWII. Copyright belongs to the Crown ; Credit: Canada. Department of National Defence / Library and Archives Canada / ecopy. Item no. ZK-893-7. Little is known about the role the CWAC played within the Unit, and even less is known about the lone female combat photographer that served with the Canadian Film and Photo Unit during WWII. Recently, the Library and Archives made available a selection of colour photographs shot during WWII, and I will be sharing those taken of Sgt. Karen Hermeston, of the CFPU. Requiring unique skills, members of the CFPU were made up of personnel familiar with the art of photography and film-making. The Unit was comprised of a total of 74 cameramen, both stills and cine. These combat cameramen were a unique bunch, with backgrounds ranging from film studio director’s to Hollywood stuntmen. Standing out in this field was a single still photographer, that through impossible odds and perseverance, achieved a station within the Canadian Forces traditionally filled by men. This still photographer was diminutive in size but was monumental in being the first woman photographer in the Canadian Army. Her name is Sgt. Karen M. Hermeston. Recently, the Library and Archives Canada has posted and made available a rare collection of colour photographs. Within this collection of photos are images of Sgt. Karen Hermeston, posing with her camera, an Anniversary Speed Graphic. To accompany the photos I have added here an interview with Sgt. Hermeston by Sam Koffman, one of the staff writers from the Canadian Forces newspaper, the Maple Leaf, in November 1945. The Maple Leaf – Nov. 17, 1945, page 2. 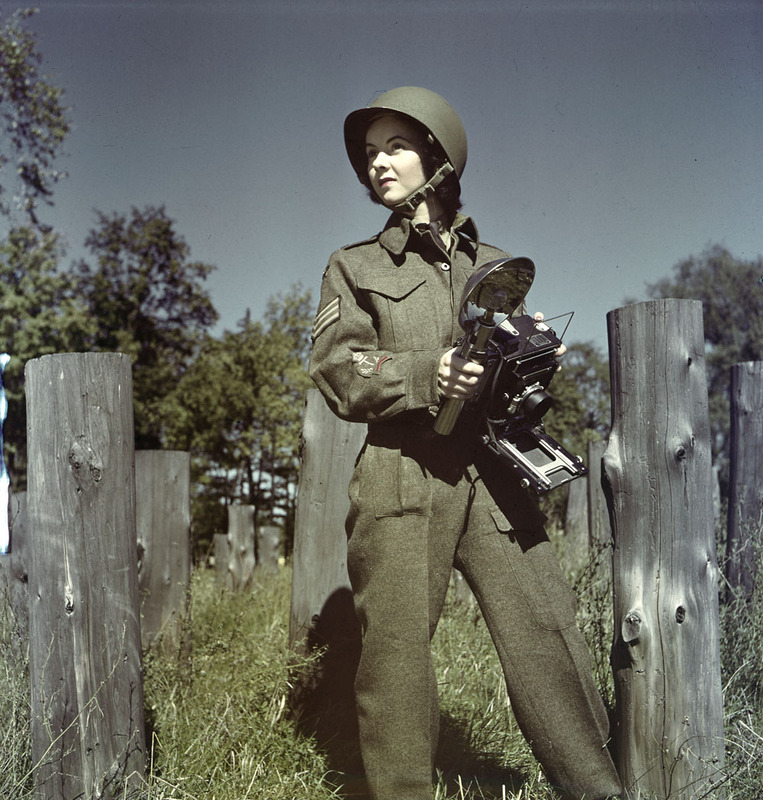 She’s “Hermie” Hermeston, a determined little gal from Northern Ontario, who has spent over four years in uniform snapping pictures of her sister CWAC’s, the red braid and the plain khaki – the only female photographer ever used by the Canadian Army. “Hermie” Hermeston is only a bit of a girl really, that slight, perky CWAC sergeant you see at all the big events, aiming her camera at the brass and the other ranks alike. She may be squatting on her knees, lying prone on rafters, climbing ladders or dropping into pits – any place or position for a good picture. When the Canadian Army’s Film and Photo Unit sends Hermie out on a job, some clear and interesting “shots” are a certainty. When Karen Hermeston joined the CWAC’s, among the first way back in 1941, she professed qualifications as draftswoman, storewoman or seamstress. She was willing to do anything to get that uniform on. But in back of that Englehart, Ontario, girl’s pert head was a single plan, centred around a camera. She had had a bit of studying in interior decorating at the Ontario College of Art, Toronto, but photography was her passion. Hermie got the uniform all right, and for one day was a storewoman, one month a seamstress, a receptionist for two days, and finally a definite job as draftswoman, attached to the Engineers. Her own hours – and a few stolen from her bench – were spent flitting about Ottawa with her own Rolli camera, snapping pictures of CWACs and others, which she sent to Mayfair, Chatelaine and other women’s periodicals. Three successive monthly editions of Mayfair carried a full-page spread of Hermie’s photos. But even this success could not get her a job as photographer with the Army’s Public Relations outfit. “A woman! Never! Wouldn’t do!” said the brass.” So she settled for a position filing other photographer’s works for PR and continued to take pictures with her own camera. Then came the first break. The Montreal Standard used a layout of photos taken by Hermie of CWACs training in Kitchener. A tour of CWAC training camps across Canada followed. Hermie was given “flash” equipment, and unofficially she was PR’s only photo-girl. In October, 1944, Hermie crossed the Atlantic, coming over ostensibly to photo CWAC’s in Italy and on the Continent – but she ran into a familiar bottleneck. PR officials overseas echoed the “no girls” as photographers. But she did get out on jobs where CWACs only were concerned until gradually her presence at Film and Photo was taken for granted; she took her turn on all types of assignments. Photoing the body of a dead soldier behind the Beaver Club was among these, and while Military Provost, civilian police and SIS personnel marvelled, Hermie nonchalantly went about her business of taking shots. Nor has she attended many boxing shows before hopping onto the ring-edge to flash fighters in action. There were many journeys too with Canadian war correspondents about locations here and on the Continent. Working with her on a feature story is a treat. She asks what the writer wants, then sets up the “shot” as she figures it will come out best. There are no angles about photography that are strange to Hermie. Her camera at the “ready,” she’d walk through the lines at a inspection, shrugging off the “wolfish” remarks of officers and men. In Ottawa she crawled underneath trucks for pictures of new inventions or inside a tank to twist herself into a knot for a photo required by Munitions and Supply. Generals or privates, they are all the same to Hermie – just pictures, and her directions are given in crisp, business-like tone. To Hermie many CWACs owe the thrill enjoyed by their families at seeing the daughter in a hometown paper, though here in England photography is a rough-and-tough go. Infrequent sun outdoors and poor lighting indoors necessitate long exposure and minute application to each picture taken. “But it means a lot to those girls, and, then, the boys like getting their pictures taken too,” opined Hermie. Post-war ambition? Well, Hermie doesn’t really know yet. She could probably tie up with a newspaper photo agency. Or she might go to New York and study fashion pics. “Maybe I’ll even get married,” she added haughtily. The photo as it appeared in the Maple Leaf on Friday, August 17, 1945. This article is dedicated to the men and women of the Canadian Film & Photo Unit. NOTE: To see Sgt. 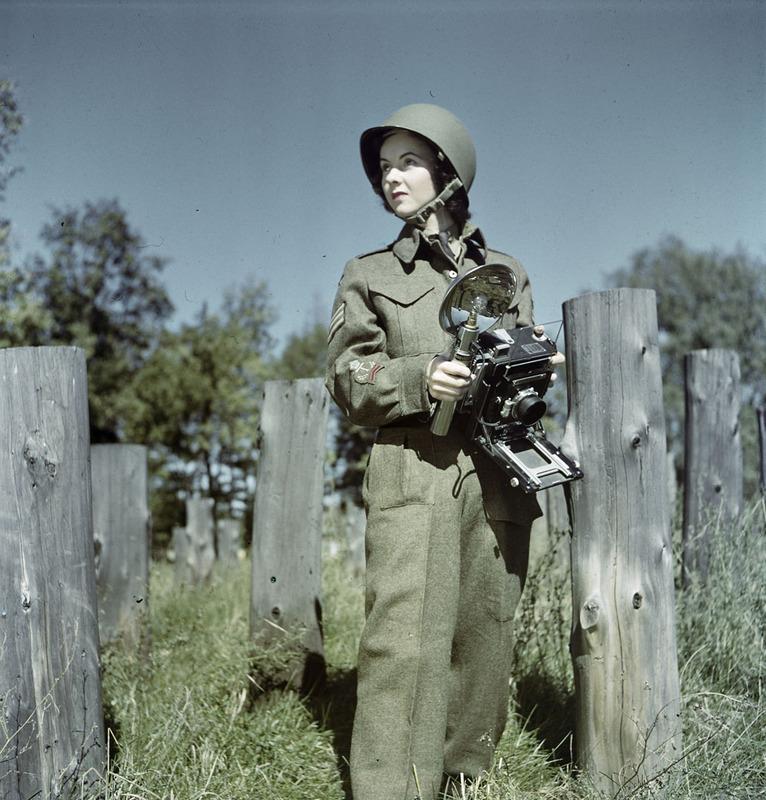 Karen Hermeston at work, be sure to view Canadian Army Newsreel Issue No. 53, “1944 In Review”. Sgt. Hermeston is the CWAC photographer taking pictures of Ernest A. Smokey Smith of the Canadian Seaforth Highlanders, Victoria Cross winner.